My husband loves to be the center of attention. Not in a vain or conceited way. He just likes to talk, a lot. And he really likes to make people laugh. He's the kind of person where in grade school he would talk to everyone so the teacher would move his chair to the back of the room. No big deal, he will talk to the people back there. No one else back there with him? That's fine, he will talk to himself. He will carry on a conversation with anyone and everyone. However, my husband hates celebrating his birthday. The biggest complaint he has about birthdays, "standing there while people sing Happy Birthday is embarrassing." His birthday was last week and he made me promise that there would be no birthday celebrations at all. He finally gave in and said we could go to dinner with my parents and my siblings and their spouses, an adults only family dinner. I was thrilled! As we were driving to the restaurant, he made me promise that we would not have the wait staff come out with cake singing Happy Birthday. I did not pass this promise on to my family and they told the waiter we had a birthday to celebrate. My husband, when he saw what they were talking about, told the waiter no. My husband's stand on his birthday has always bothered me. Why? Because I love him and I want to celebrate him. As I was thinking about this last week, it dawned on me that I don't need a birthday to celebrate him! Celebrating him doesn't have to be balloons and cakes and candles and a song. It can be the every day things. If your husband gets a promotion at work, is asked to lead a Bible study at church or is selected to coach a team, whatever it is, celebrate it. My husband is finishing up his final courses for his pastoral licensing. After each class, even after each test, I can celebrate him achieving this important goal he has set for himself. Thank him regularly for going to work and supporting your family. If his job is something you can physically see, admire it. My husband works in sheet metal. Sometimes he likes to drive the kids and I by his job sites and show us what he does. We can use this time to really see what he does and celebrate his hard work. If your husband helps with the dishes, takes the trash out, bathes a kid or even just puts his shoes up, thank him. Show appreciation to him and celebrate him. Let him know that you appreciate his help because you understand he could have just sat back and done nothing. When you see your husband reading the Bible, tell him how proud you are that he is in God's Word. When he writes out that tithe check, tell him you appreciate him being obedient to God in your tithes. When he witnesses or prays with the kids, show him how honored you are that he is living out his faith. Celebrating doesn't have to only be for an occasion. Celebrate your husband every day. Celebrate him with your words and your actions. Let him know how much you love, appreciate and respect him, what better way could there be to celebrate him? How do you celebrate your husband? Share in the comments! I think this post is perfect timing. 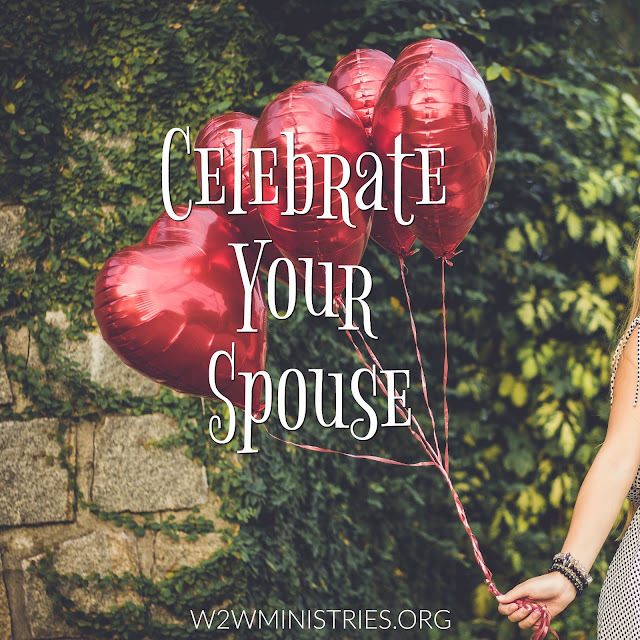 I believe often as a busy mom, we often forget to celebrate our husbands and the things they do for us. Thank you for sharing these ideas!